Dozens of friends and family members gathered at Kinston Fire Department No. 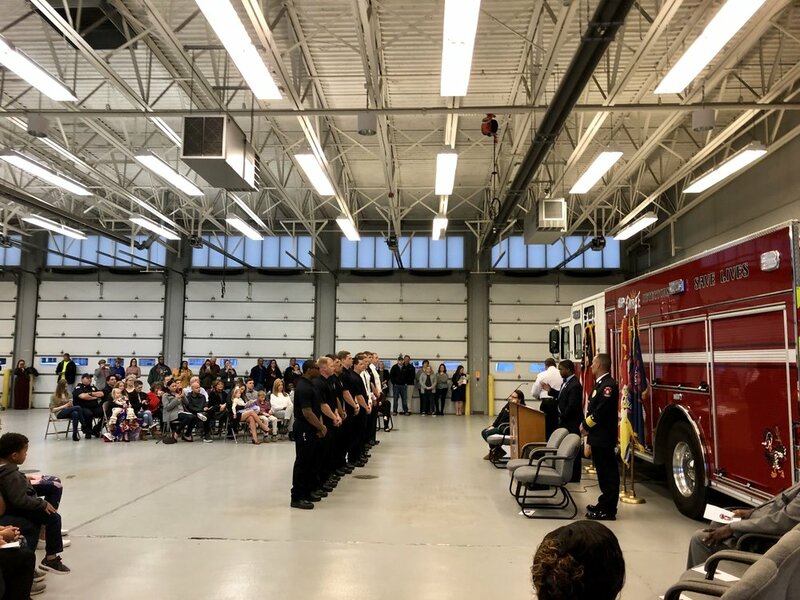 1 Wednesday night to celebrate promotions and the swearing in of new members of the Kinston Department of Fire and Rescue. The ceremony honored six members of the department who recently received promotions. Ronald Fritter and Antwan Hardy were both promoted to the rank of Fire Control Specialist II, while David Young, Jeremy Pearson, Tyler Foyles and Jason Lee were promoted to the rank of captain. In addition to recognizing the promotions, the ceremony also honored 30-year department veteran Earnest Davis as he was named Deputy Chief. Chief Damien Locklear said when he took over as chief in January, he recognized that the current department structure did not have a deputy chief position. Creating the deputy chief position, he said, was important in order to ensure that, in the event of the chief being unavailable, the department would have someone in charge so that it could continue to provide service to the community. Davis said the recognition means a lot to him. Kinston Mayor Don Hardy swore in the 11 new members of the department, as they took the oath to serve the community. Fire Control Specialists Jeffrey Frazier, Alexander Galloway, Frederick Riehle III, Dustin Clapp, Steven Miller, Mark Neal, Luis Ortez, Garrett Quiroz, William Renfrow and David Rose and Fire Inspector Brock Kearney were all sworn in to the department. Hardy said he was excited to be a part of the ceremony, and for the growth of the department under Chief Locklear’s leadership. “I hope (the department) can continue to grow and promote from within,” he said. Newly sworn in Fire Control Specialist I Steven Miller said his first weeks in the department had been exciting, though filled with some tough training. “The high-rise training has been the hardest,” he said, but he added the experience had been good so far. After the ceremony was over, family and friends were able to join the members of the department for a reception.